Hampton Inn & Suites/Tru by Hilton Charlotte Airport Lakepointe is expected to be completed in December 2018. While properties hosting more than one brand have been around for more than a decade, the multi-brand approach is now growing and thriving in today’s market, and maybe that’s because of the shared interest among the lodging industry’s key players—hospitality groups, asset managers, developers, owners and management companies. Each plays an essential part of the process, and the overall outlook of this trending development concept from each of its participants is—for the most part—full of optimism. This collective enthusiasm is giving legs to the multi-branded hotel movement—encouraging the industry as a whole to think bigger than ever before. According to published data from Lodging Econometrics—a Portsmouth, NH-based global real estate intelligence company—across the United States, there are, as of the second quarter of 2017, 116 dual/multi-branded hotel projects (with a total of 15,478 rooms) under construction in the construction pipeline; 153 projects (with a total of 15,803 rooms) getting underway within the next 12 months; and 63 projects (with a total of 5,924 rooms) in the early planning stages of construction. Hospitality groups are the ones truly driving shared site developments across market segments. These franchise companies are “trying to come up with some more unique solutions to get further brand distribution,” Bruce Ford, SVP and director of global business development at Lodging Econometrics, told Hotel Business. 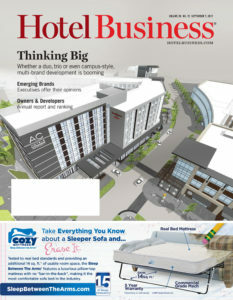 “By having two or three distinct hotels under one roof, a multi-brand hotel can help a hospitality group increase its brands’ distribution and awareness in a given market—in addition to helping drive returns for the owner,” said Eric B. Jacobs, chief development officer of North America select-service and extended-stay brands at Marriott International. For hospitality groups, the “primary advantage is the ability to address two market segments in one building,” said Bill Fortier, SVP of development in the Americas at Hilton. “There is also the benefit of having two deals versus one with the same owner or management company.” The McLean, VA-based hospitality company currently has 60 multi-branded properties globally, with roughly 120 projects in the pipeline. A dual-branded property of Hilton’s recently opened in Canada, the Homewood Suites by Hilton and Hilton Garden Inn Calgary Downtown. 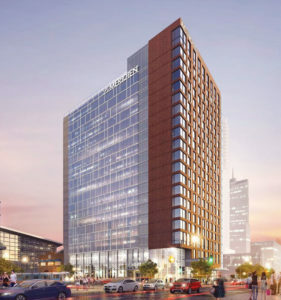 Hilton just broke ground on a new Tru by Hilton in Charlotte, NC, which will be a dual-brand property with Hampton by Hilton. The property will have 219 rooms, with 107 for Tru by Hilton and 112 for Hampton by Hilton. Additionally, the shared-site property will have two distinct lobbies and a dining area. Hampton Inn & Suites/Tru by Hilton Charlotte Airport Lakepointe is expected to be completed in December 2018. 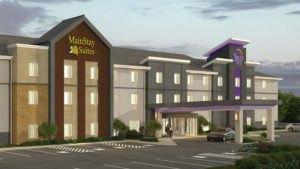 Choice Hotels International has a Sleep Inn-MainStay dual-brand concept, which attracts both short- and long-term guests. Fortier agreed with Quinn with regard to market segments of multi-branded properties. “For example, length of stay or quality segmentation (midscale or upscale) when you have a site big enough to accommodate both,” Fortier said. “It also makes sense when you have property management that really understands both segments and brands.” The market is what ultimately determines whether a multi-brand property will be ideal. In addition to the above considerations, Jacobs acknowledged the importance of brands staying authentic—despite sharing space. “The most critical factor in a dual-branded hotel project is to ensure the different brands maintain their identity—such as separate entrances and lobbies, and different design and amenities—to keep the guest experience pure, ultimately enhancing value for the owner,” he explained. The Bethesda, MD-based hospitality giant began construction on its first triple-brand property in 2016. 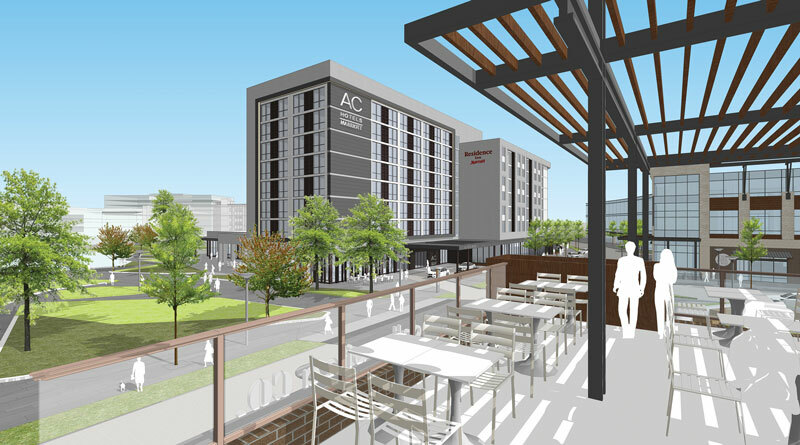 Set to open mid-year in 2018, the 470-room hotel, which will be in Nashville, TN, will contain an AC Hotels by Marriott in one wing and a combined SpringHill Suites by Marriott and Residence Inn by Marriott in the adjoining wing. As of August 2017, Marriott has 81 dual-branded hotels open and another 146 approved, including 62 under construction in the U.S. and Canada. These numbers reflect Marriott and Starwood, and are for select-service brand hotels in North America. While hospitality group execs expect multi-branded properties will continue to grow, Choice—with 50 Sleep Inn-MainStay properties in the pipeline—expressed how the evolving guest is impacting the increased need for multi-branded properties and the way franchisees are doing business. “As guests are becoming savvier and looking for certain types of amenities, franchisees are opening dual-brand properties, so that they can offer guests variety and everything they want based on their travel needs,” Quinn explained. The hospitality group interviewed guests on preferences for both short-term and extended-stay properties before officially launching the Sleep Inn-MainStay prototype. From an asset manager perspective, these multi-brand properties can be attractive investments if done correctly—and that’s a big “if,” pointed out Kristie Dickinson, EVP of business development and marketing at CHMWarnick, a Beverly, MA-based hotel asset management and owner advisory service company. “They can offer optimized revenue potential through product and brand diversification, appealing to a wider pool of guests and potentially groups; enhanced control over inventory/cross-selling, as well as potentially higher ancillary revenue spend with more guests on property; and on the cost side there are operating efficiencies, most notably in labor, as well as development cost efficiencies (in most cases),” she explained. Finding opportunities to enhance revenue and reduce costs through efficiencies is top of mind for asset managers; shared properties can more easily assist with these objectives. She did provide a word of caution to both owners and management companies: Avoid poor decisions resulting from ideal brands not being available. “There is no magic formula to getting these combinations right, outside of arming yourself with true industry experts who have been down this path before… Co-branding is not for amateurs,” Dickinson said. Hank Jones, a partner at Kallenberger Jones & Co., a hotel investment consulting firm, told Hotel Business that multi-brand properties have been growing over the years because of the increasing synergies between brands. “It is clear that there has been significant growth and that this trend is gathering steam,” he said. “However, it is difficult to quantify the growth because hotels are typically not marketed as being part of a dual brand. In fact, if you were to search on the internet for a hotel that is part of a dual-brand development, you would likely find no references to its sister hotel, and the photo of the hotel you were searching would make it appear as if it were a stand-alone property.” A multi-brand property will benefit greatly if land is scarce or if the right type of land isn’t available. Other advantages of a multi-brand property include expanded market appeal, construction cost efficiencies with shared spaces, larger and more appealing public spaces, and operating cost efficiencies. “For example, payroll costs involving the GM, accounting staff, engineer, head of housekeeping and other hotel staff can be shared between the two hotels,” he said. In agreement with Jacobs, he said it’s also essential for brands at these properties to maintain a good reputation and stay authentic to market and price positioning—since there’s co-dependency between brands. “There is a risk that one of the hotels might lose its brand identity, which may harm the market image of its sister property,” he said. If the market is strong enough for one hotel, then a multi-brand property may not be needed. Pairing a lesser-known brand to an established brand is also a questionable tactic, at least from an investment standpoint. “There are many new brands out there, largely untested in my opinion, and it’s easy to get caught up in taking a risk especially if key money is involved—but that could be a recipe for disaster,” Dickinson explained. “The brands being considered, and their respective room counts, still need to be financially feasible as if they were going to be built independently.” There should always be a focus on finding complementary brands, ones supporting the overall investment strategy. White Lodging has an investment strategy with cities in mind, and multi-branded properties aid in progressing this. “With our urban-centric investment strategy, dual branding is an excellent vehicle to maximize the density of costly land, while also providing significant development and operating efficiencies,” Yiankes said. 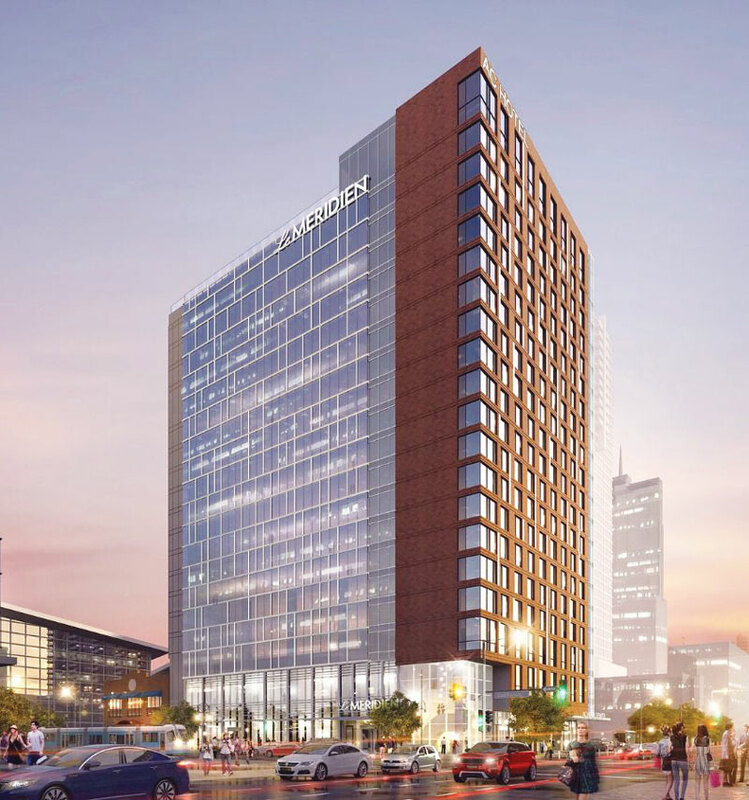 “In many cases, it allows one location to serve multiple segments without compromising the integrity of each individual brand.” White Lodging’s Le Méridien/AC Hotels Denver Downtown is expected to open this month. This project marks the first collaborative project from Marriott and former Starwood brands since the merge late last year. For instance, NewcrestImage opened its first dual-brand property in 2013 near the Dallas/Fort Worth International Airport—a 181-room Courtyard by Marriott and a 120-suite TownePlace Suites by Marriott. The development and management company has two dual-brand projects in the final stage of pre-opening—one in downtown Dallas, a 128-room AC Hotel and a 121-room Residence Inn, both by Marriott; and in Oklahoma City’s historic Bricktown area, a 142-room AC Hotel and a 134-room Hyatt Place. NewcrestImage has developed a “hotel campus” concept that will include four brands on the same site in Texas. NewcrestImage has taken multi-branded properties to another level by implementing a new concept called “hotel campus,” an idea that places multiple brands immediately adjacent to each other on one site. “In North Dallas, we have broken ground on a four-brand, 600-room project that will feature an AC Hotel and a Residence Inn, both in a single building that offers 300 rooms,” he said. “There will be a Canopy by Hilton and a Hyatt Place, each in a separate building within 50 ft. of each other, and each with 150 rooms.” Keeping brands within their own hospitality group allows the hotels to take advantage of the multi-brand approach—otherwise they’d lose some of the potential benefits. There are ways for management companies (at least those with the right experience) to leverage a multi-brand property as well. “Dual branding is a smart use of expensive land and a financially responsible operating model that experienced management companies can use to deliver truly superior results,” said Gerry Chase, president and COO of New Castle Hotels and Resorts, a Shelton, CT-based management company. “There are several advantages to a dual-branded property, including lower development and operating costs and better market penetration.” A dual-brand strategy may be a sensible approach when land costs are high and supply gaps are spread out across segments. Bob Habeeb, CEO of Rosemont, IL-based First Hospitality Group, a management and development company, pointed out the significance of multi-branded hotels in urban areas and smaller markets, something developers also appreciate. “Multi-branded hotels can be a great answer in a number of circumstances,” said Habeeb. “In urban centers, land acquisition costs can make the economics for a single hotel development difficult. In smaller markets, multi-branded hotels can allow a single site to address multiple market segments.” These developments, essentially, reduce costs through shared infrastructure costs. Again, choosing brands for locations begins with the market. For Carrollton, TX-based Atlantic Hotels Group, studying the market first for demand is key. Then the management and development company finds brands best suitable for the market conditions. “Usually, we pick one transient and one extended-stay property to ensure we capture both types of clients,” said the company’s CEO, Perry Molubhoy. FHG’s president and CEO agreed on pairing extended-stay properties with transient hotels. “It makes the most sense to either mix hotels by market tier or more likely by market segment,” Habeeb said. Back in January, First Hospitality Group and Hilton announced a partnership to bring the hospitality group’s first triple-brand hotel to McCormick Place in Chicago. The 466-room property will consist of the following brands: a Hilton Garden Inn, a Hampton Inn by Hilton and a Home2 Suites by Hilton. “If the market can support additional supply, we evaluate unmet customer needs, consider brands that aren’t currently present in the market, and then ensure that the price points of the properties can support the capital investment,” New Castle’s Chase said. One of the top markets for multi-branded properties—Nashville, TN—has 17 multi-branded projects with 1,292 rooms in the construction pipeline, as of Q2 2017. “In Nashville and the surrounding area, almost every brand is represented or under construction,” Chase added. “Brands would have to be carefully considered for additional supply.” New Castle is currently planning a dual-branded property in the surrounding area. Detroit: Positive KPIs, but supply a concern?